Everybody needs a day when you can stop being the regular you, and you can be a cowboy for a day. B-Bar Farms has been helping a community connect with a past, an animal, and a soul. Nestled in the woods of Northern Durham/Eastern Orange County is a family owned farm with cows, chickens, a goat, a dog and yes – horses. The perfect get away from the everyday life, in what has now become one of the top places in America to live – Durham, NC. Out here you can comb and groom and ride the horses and commune with nature. It’s the kind of get away we all need every now and then. B-Bar Farms has been providing an intimate get away for over 40 years. 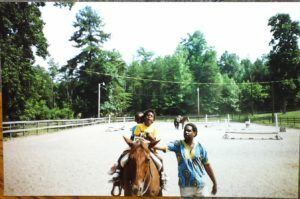 This year for Father’s Day my daughter helped me calm my soul with a horseback ride. Horses are a way for me to connect with my ancestors and my daughter. My first riding experience happened when I was very young. When my Uncle John would place me on the back of a cow and walk me around the coral in the back of the farm house. As a college student at the University of Florida, I would spend my weekends with my family near Newberry, FL. There was a nearby stable that I quickly became a regular at. It was in this area that I first developed a love of horseback riding. 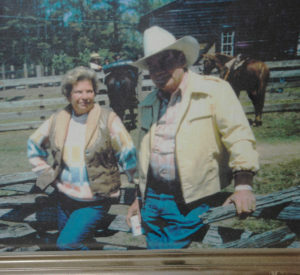 Every time I mount a horse, I think about my dear Uncle John and Aunt Ella. These were some of the kindest people on the planet. 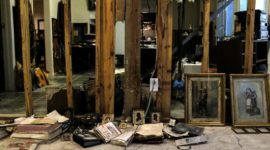 Leaving Florida and moving to NC, I discovered a wonderful place in Northern Durham county, a place that took me back to my past. Nothing can describe the thrill of sharing my memories with my children. 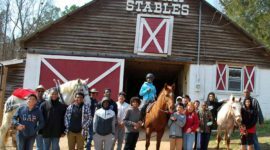 When B-Bar Farms started to rent out horses, George Dalphus “B-Bar” Browning’s idea was to provide a place for kids to get away. Many children now days do not get exposure to the outdoors and animals like I did as a kid; and exposure to nature and farm animals is a good thing. As Carolyn Wilson, Dalphus’s daughter, put it “Exposure is so much more important now. And that’s what daddy wanted.” On Jan. 29, 2008 George Dalphus “B-Bar” Browning, passed away at the age of 81. To prevent the farm from closing Dalphus’s middle daughter, Carolyn, stepped in to run the farm. And what a job it has been! You see B-Bar did not just run the farm; B-Bar was the farm. He ran a one-man show for many years. He cut his own hay, feed and groom the animals, and rent out the horses all himself. “He’d let you make your own errors and then you’d learn.” Carolyn tells us – “That was the cowboy way back then”. On the day my daughter and I visited, Carolyn’s son Lucius (Luke) was in town helping care for the horses; so we all sat down for a talk. My Roots Foundation met with Carolyn and Luke because we are interested in telling the stories of the community. B-Bar Farms has been a part of the Durham community for many years – 3 generations of the Browning family have now been involved in the farm, and multi-generational customers like my daughter and I are a common part of their customer base. 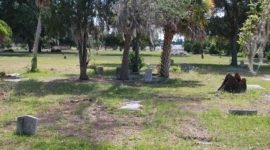 He bought the property from a Mr. Love, a land surveyor, in the early 1960s. After a while he moved all the animals to the current location of the farms, 3918 Bivins Road Hillsborough NC 27278. Eventually B-Bar opened the barn to boarders and then he began to rent horses by the hour to show people how to ride. At its peak, Carolyn remembers that B-Bar had from 50-80 horses at one time. 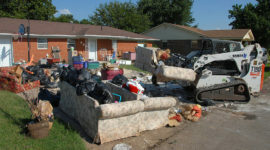 “We would get the horses brushed and saddled and ready to rent out,” Carolyn recalls. She and her sister would get $5 per week to clean out stalls with cow poop in them. 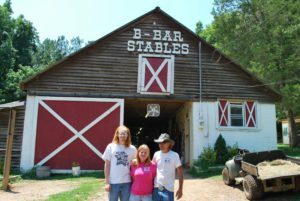 As you drive onto the property, B-Bar Farms is quite an enterprise, there are multiple buildings, a riding coral, the tack shop, and a picnic area. And to think at one point this was all a one man show – back in the days when B-Bar did it all. Over the years Carolyn has learned that the Tack Shop is nice to have but she recognized that she spends more time outside riding and giving lessons. Horse rentals, summer camps and riding lessons make up the bulk of the farms activities today. 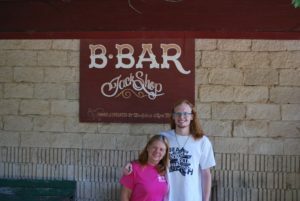 Carolyn and Luke expressed that they were not certain of what’s next for B-Bar Farms. Luke commented that we are “Living in a much different time – the digital era. Word of mouth is no longer good enough to get the word out. Most of the current helpers are volunteers.” Thanks to volunteers, they now have a Facebook page; and a website. People come out here to enjoy the animals and the fresh air. Being with the horses relieves a lot of stress. It’s a time to not think about the jobs and how stressful life is. Horses relieve a lot of stress for children as well. Children come and can just be cowboys and cowgirls for a time. The farm has even helped children that are shy or have a disability step out of their comfort zone and connect with a horse, and then with the rest of their world. Just look at the online reviews and you’ll see how many parents are both amazed and thrilled at the behavior differences they see in their children after they’ve spent time on the farm. Luke likes horses, a lot; he’s been on horseback since he was 9 months. He is working to get a Masters of Social Work and is looking into the field of equine therapy as a potential future. Carolyn feels like she found her calling being here. She hopes that Luke will take it even further by working with the horses as vehicles for people to connect with nature and with themselves. But for now, the community still enjoys the peaceful time away from city life where you get to come out to the farm. brush a horse, and take him out for a ride. It does wonders for the soul – just like it did back in the cowboy days of the past, the present, and the future! So come on down to B-Bar Farms and enjoy a horseback ride for your soul!